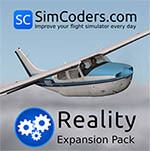 Simcoders has done a very small but important update to their Reality Expansion Packs (REP) for the Carenado Cessna CT210 and the Bonanza F33 and V35. Item covered in this update is related to the braking system which had a bug related to the hardware rudder pedals algorithm. Because of this bug, the joystick axis were not managed correctly, resulting in the toe brakes to work only partially. Version 2.5.1 is meant to target this issue and to make your rudder pedals to work correctly. The update also covers and fixes some minor things in the C210, such the altimeters knob manipulator and the aileron trim tab. Just go to your account at the X-Plane.Org Store to update to the new v2,5.1 version as it is available now. All the mentioned packages above are for the Carenado airplanes. There's a typo in the first line when speaking of the Cessna 210.